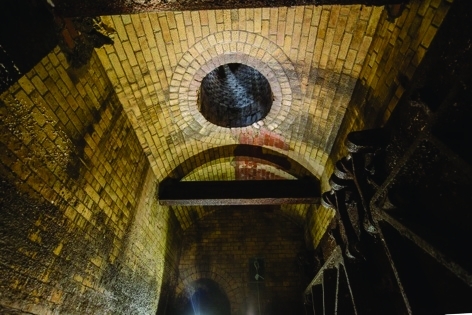 Joseph Bazalgette’s London sewers may be the greatest engineering feat of the Victorian age. Comprising almost 900km of tunnels lined with 318 million bricks, the system took just six years to build, during which time seven million cubic metres of earth was scraped out of the city’s underbelly and the River Thames was contained within permanent embankments, creating the landscape of modern London. The sewers diverted the city’s sewage, via huge, elaborate pumping stations in north-east and south-east London, to treatment works and out into the estuary, well downstream of most of the population. In building this system, Bazalgette immeasurably improved public health and the atmosphere of London, banishing the ‘great stinks’ from raw sewage flushed into the river and averting the risk of cholera epidemics, which had plagued the city for centuries. Part of Bazalgette’s genius was in specifying the capacity of the sewer system. In the late 1860s, when the project began, London was at the tail-end of a population boom, with two million inhabitants. Bazalgette insisted on building enough sewers to cope with four million. But today, London has eight million people, and Bazalgette’s system can’t cope any more. Increasingly frequent overflow events, where untreated sewage spews into the Thames, are damaging the river’s ecosystem and leading to public health concerns. To counter this, a new system is being planned that will see a cavernous tunnel bored under the river, keeping the capital clean and healthy into the 22nd century. 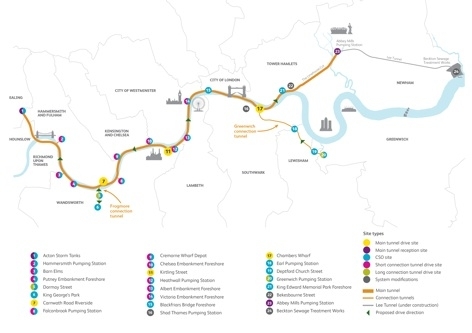 The Thames Tideway Tunnel, which is currently in the consultation stage awaiting a decision from government in the autumn, is planned to run from Acton in the west to Abbey Mills in the east; a 25km route, mostly following the line of the river. ‘Bazalgette had fantastic foresight; the problem is absolutely an issue of capacity and nothing to do with the condition of the Victorian sewers,’ the head of the Tideway Tunnel project, Phil Stride, told The Engineer. Despite Stride’s assertion, there are other factors at work here, chiefly the design of Bazalgette’s system and the way London has developed since the 1860s. The sewers constitute a combined sewerage system; that’s to say, they carry both sewage — the waste from toilets, plugholes and drains — and rainwater in the same pipes. 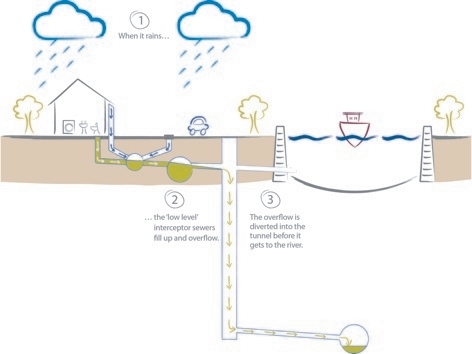 If rain swells the volume of liquid in the sewers that run under the city’s streets beyond their capacity, they overflow into purpose-built outflow pipes and discharge into the river. Increasing population, and therefore more sewage, is one reason this happens more often now than it did in Bazalgette’s age. Another is the gradual concreting-over of open space. The rise of the motor car (and lack of space in the suburbs for garages) means that people have increasingly sacrificed their front gardens for off-road parking, and the rainwater that would have soaked away into flower beds now runs off into the gutter and to the sewer. Industrial and commercial development has also added to the problem, with open space — particularly on the edges of the city — taken up by industrial estates, supermarkets and shopping centres, invariably with large car parks, which also can’t absorb water. And once it’s in the river, it’s bad news. In Bazalgette’s day, the river was in such a dire state that nothing lived in it; the occasional overflow wasn’t really a problem once the bulk of the sewage had been taken out of the way. But with the 20th century clean-up of the river — since privatisation in 1989 alone, Thames Water has spent £3bn on water treatment works in the Thames Valley above Teddington — the river now supports a lot of marine life, with 125 species of fish. When sewage overflows, it soaks up dissolved oxygen and the fish asphyxiate. And in the tidal Thames, ‘plugs’ of sewage get washed up and down the river; in summer, it can take three months for waste to make its way down river from Teddington to the estuary at Southend. Moreover, Stride explained, it means that the water quality in the estuary is often below the standard stipulated by EU directives. Hence the Thames Tideway Tunnel. 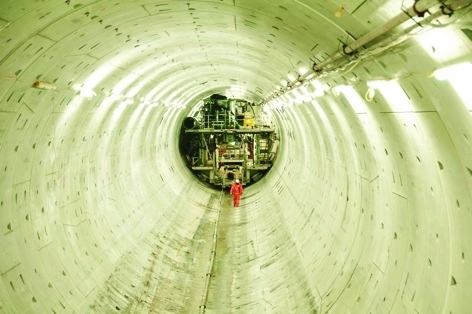 At £4.1bn it will be the largest privately funded infrastructure project in Europe, and by far the largest project Thames Water has undertaken since privatisation (the next largest, at £625m, is the Lee Tunnel, which is nearing the end of construction. Connecting Abbey Mills with Beckton, it will prevent overflows from London’s largest combined sewerage outflow (CSO) at Abbey Mills, which is responsible for 40 per cent of the sewage outflow into the river all on its own). The Tideway Tunnel will run from 35m underground at Acton to 75m at Beckton, a drop of 1m for every 790m. This is enough of a gradient to ensure the tunnel is self-cleaning — the current will sweep solids along with it, preventing faecal matter from festering and conditions becoming septic. It is also below the level of the existing CSO tunnels, and will be connected to them by vertical shafts which will intercept overflows from the shallower Bazalgette sewers and carry them down into the deeper tunnel. Its diameter will vary from 6.2m to 7.5m along its length. The tunnel will be accompanied by extensions to five water treatment works, mostly east of London, to handle the increased sewage flows; but the tunnel is by far the most challenging part of the project. Intercepting 34 CSOs, it goes through 14 London boroughs and will require 24 separate construction sites, 21 of which will be large — three drive sites where tunnel-boring machines (TBM) will be launched, two reception sites where the TBMs will be recovered, and 17 sites to intercept the discharge points. Attentive readers will notice that 3+2+17 is 22, not 21 — one of the reception sites is also an intercept point. The geology doesn’t help. The tunnel will go through clay in the west, mixed sands and gravels (technically, Lambeth beds and Thanet sands) in the central region and chalk in the east, each of which requiring a different type of TBM. The latter two regions are fissured rock through which water can pass, so at 65m underground the workface will be under 6 bar of water pressure. ‘That affects the type of TBM we use, so the workforce aren’t exposed to those pressures,’ Stride added. The intercept shafts, especially at the eastern end, are some of the deepest in the world. These shafts are being sunk using advanced diaphragm wall techniques, where the excavation site is surrounded by a concrete wall to prevent water getting in. The wall starts out as a circular trench, which is kept filled with a slurry to stop it from collapsing; the trench is then filled with concrete from the bottom up to displace the slurry. Once the diaphragm wall has set, the material within the circle can be excavated. ‘Maintaining the verticality when you’re lowering concrete panels 70m below the ground is quite a challenge, and we’re proud of the tolerances we’ve achieved,’ Stride said. 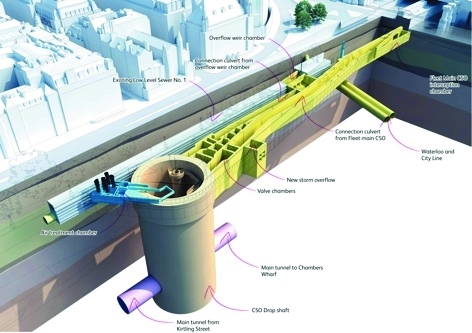 Threading through: how the new tunnel works, including the intercept shaft, relate to existing infrastructure at Blackfriars. 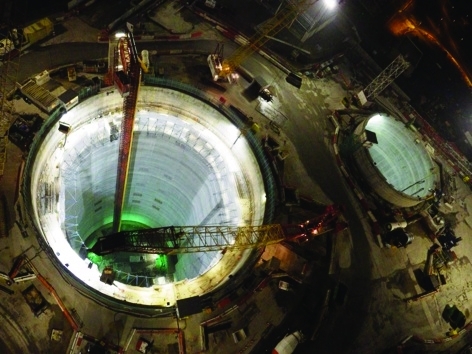 The tunnelling techniques used will be similar to those of Crossrail, although it will use much less sprayed concrete tunnel lining, which characterises the building of Crossrail’s stations. Only some of the points where interceptor shafts meet the main tunnel will require sprayed concrete; the rest will use precast slabs emplaced by the TBMs as they bore through the rock. But implementing SuDS instead of building the tunnel can’t be the answer, he insists. ‘The tunnel will handle 1.5 million cubic metres, even though it should only fill to capacity about seven times per year; it also acts as storage, and we can pump the full capacity out in 48 hours. You’d have to deal with that volume whatever you did, and you’d need an area of parkland 40 times the size of Hyde Park to handle half of it. It’s by no means impossible to dig up all the car parks and resurface them with permeable materials, install water butts for every building, put on green roofs and so on, but we estimate it’d cost £13bn and take 40 years, and cause the most enormous disruption across London. The Tideway Tunnel is the best and most cost-effective way of dealing with the problem in a reasonably short timescale and achieve the water quality the EU demands,’ Stride claimed. The project plans to put measures in place to reduce disruption. Ventilation pipes, which will ‘exhale’ air as the tunnel fills, will be fitted with activated charcoal granule beds to remove odorous compounds before they reach the air. And the construction sites, which Stride concedes will inevitably cause disruption, will be arranged to minimise this. Might I suggest that anyone reading the above might also be interested in reading articles in the latest issues of Private Eye (1359/1360). There are two main questions, is it needed and why is it very likely that the project will be financed via the Cayman Islands? 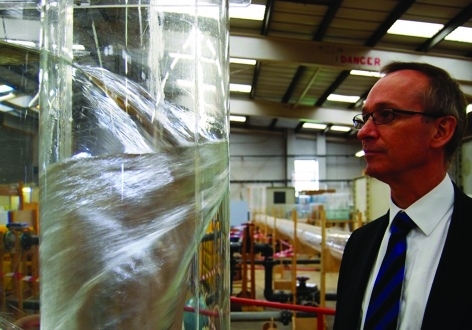 To reduce costs (£4.1bn) Thames Water could potentially double their capacity by ensuring the silt and sludge is removed regularly from the system off site. Has the capacity required been calculated on the Bazelgette capacity or the current capacity with a 50% silt/sludge level? in my experience, these are significantly different! in the future, what happens when all this silt enters the Tideway Tunnel and reduces the Tideway Tunnel capacity? Do we then build Tideway 2 as the cost of removing the silt is now too high?